This story is late in coming and as elusive as the Great Skunk Ape itself. But honestly, I’ve been rather ill and alternately busy all week. It was 4am last Saturday , and both Mr. Kallisti and I could not sleep. We’d fallen asleep rather early underneath the “2 weeks past” Christmas Tree. and were suddenly perky in the wee dark hours of the morning. I immediately think “road trip!” and then shortly thereafter “breakfast!”… what else do you do when you have the whole weekend spread out before you? You jump in the big red beast and chug off to Bigfoot Country. I’d always wanted to make a pilgrimage. I wasn’t sure if we could make it all the way up to the Bigfoot Museum in one trip, but I thought at least we could make it to Fort Bragg up on the Mendocino coast. Mr. Kallisti strangely agreed to this peculiar idea. We showered, packed a light bag, stowed the camera and headed off at 6:30 in the morning. It was a bit drizzly, but barely. In an hour we were in Petaluma where we stopped off for breakfast at a Carrows that had a FULL BAR and was serving! Mr. Kallisti was eyeballing the bloody mary and Mimosa brunch but instead gave wreckless abandon a pass, we had the defered to the breakfast menu to have the first of our trashy meals for the trip. Mmmmm, butter. After breakfast we nipped into the motel lobby next door to scavange their travel brochures. Nothing for Bigfoot, but there was the Avenue of the Giants which was smackdab in the middle of Bigfoot Country! We’d skip the coast altogether and drive straight up 101, on which I’d never been past Cloverdale. Well, let me tell you. Past Cloverdale 101 turns a bit wild. More rural, you start climbing into the mountains, and the farther we got the worse the weather turned. I was driving at this point, in Mr. Kallisti’s big red truck. The country was gorgeous. Mountains and dark clouds. Rawr. And then it started to pour. To sleet. To hail. There was snow on the mountain tops. I’d never driven in conditions such as these. It was exhilirating. It also seemed fairly clear that the farther north we got, the more low brow California became. All the rich retired hippies apparently are on the coast. The drop-outs have all set up trailer camps, wizardy art pottery stands, and redwood burl carving stations all off HWY 101. Unfortunately for us most folks were closed for the season. Including, sadness, Hobbiton! A really sad and poorly built trail with wizard statues standing in front of round doors stuck in the hillside and painted green. Neat. Most everything was covered in plastic tarp for the bad season however. We could see very little. We found Bigfoot about an hour south of the Bigfoot Museum at the “Legend of Bigfoot” tourist trap. The nice young lady behind the counter didn’t know if the museum was open but called about road conditions and up north was chains only. Zoink! And she mentioned something about the snow coming. Zoink! We were city folk, what did we know about the Wild North. It was pouring out, but we could deal with that. Snow, we had new chains but even two years later the memory of driving in Michigan blizzards was pretty fresh in our minds. 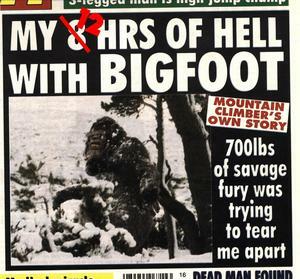 The Legend of Bigfoot had plenty to satisfy our curiosity. Lots of bigfoot crap to buy, including lazer etched redwood christmas ornaments, and crudely illustrated scary coloring books for children(that would make a whole ‘nother journal entry in and of itself), t-shirts and collector spoons. We got it all. And a picture of the twelve foot carved redwood Sasquatch in front. While we were loading up our trinket bags with goodies the wind was whipping up and outside there was a *CRASH BANG*!!! The deeper we got into redwood country, the likeliness of having an enjoyable overnight stay seemed to dwindle. The whole “sleepover in the forest primeval” thing was losing it’s appeal rapidly. By the time we were at the opening of the Avenue of the Giants it was only noon. We’d been driving for four hours, but I could easily see us trekking back home that day, saving us the motel money, and avoiding getting snowed in. The new snow chains would stay new one more season. We have all heard that redwoods are big. I’ve seen them, they’re huge. But not like this. This is old growth forest. A small pocket of trees that are pushing 3000 years old. These are the tallest living thing on the planet. And these trees are HUGE. The park, which is a 31 mile roadway meandering along HWY 101, was nearly empty. The weather was dark and wet. We didn’t care, it was magical. And spooky. And then we had lunch. In Garberville. We knew the food was going to be bad to mediocre, so we thought “What would Guy order?” (Guy is my brother. He has better luck with food than we do.) Of course. Guy would order Hot Turkey Sammiches. So we gots a bowl of chili, one hot turkey and one hot roast beef sammich and we split ’em. I have a higher tolerance for crappy food, so I thought the gloppy diner gravy was better than Mr. Kallisti did. But we both enjoyed the chili muchly. A little bit further down the road we ran into The One Log House. A wee little house built out of a giant redwood. Cute! We were walking up to the door when a couple of young hipsters, a vixen with a rainbow’d mane of dreadlocks and her dashing young Charlie Manson were going in as well. The interior was pitchblack, and it had been modernized a bit with motion sensors that were supposed to turn on lights for the peeping tourists. But they weren’t working so Charlie kept the door open to shed some light on the place, while we looked around. We were shooting blind with the flash in hopes of getting a good shot. As we parted, Charlie said “Mili hama lamo Ma hoya!” or something. Mr. Kallisti can’t remember his exact words, but like a private joke in a blog entry, you really had to be there. We had one final sighting of Bigfoot before we left the area! This was another madman hippie woodcarvers tourist trap. Taken in a torrential downpour (which didn’t come across in pictures for once). But the best thing of all was seen as we fled the area, trying to get down out of the higher elevations before dark, and temperature drop. Yeah ! Ha, caught the entry this morning. But the phone rang and I wasn’t able to finish. Uh, those gravy smothered HOts look GREAT !!! I was just exactly what I would have ordered. Unless they have country fried steak & eggs & gravy & biscuit & hashbrowns. It’s a trashy diner, what else could they have possibly made any better? That’s right, you got it. You look like you had fun! Road trips rule!